Before we get onto the knitting, my contribution to London(ish) knit bloggers' delight in our recent snowfall. 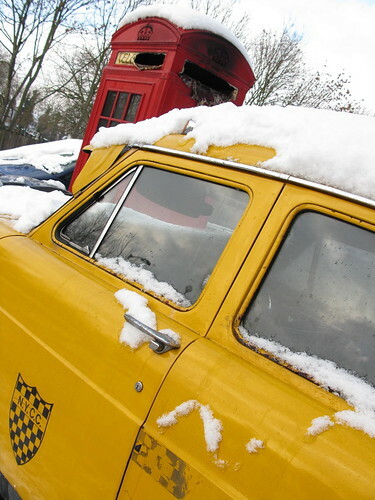 As well as the odd juxtaposition of British phonebox and New York Cab, I love the red and yellow shining in all that white light. Unfortunately, getting me, daylight, snow and photographer all outside at the same time proved impossible, so these FO shots are quite thawed. Plus, it is still bleeding cold, so it was a matter of running round the corner to the park behind our house, taking photos, running in to de-frost and change jumper, then running back. Firstly, O W L S. Even ignoring the wonder of the owls, this is a very well written yoke pattern - I may use it for a plain jumper. I loved the waist-shaping at the back, though if it does mean the unworn jumper looks a bit like it has a bustle (this might be because I gave it an extra inc and dec set to accommodate the smaller row gauge and my over-average height) The owls are fun and cute, but the button-eyes give a pretty detail and though I'm wearing jeans here, it looks smart paired with a plain black skirt, grey tights and boots. I wasn't sure the owls would be dramatic enough in lighter yarn, but I like them now they are all done and have eyes. I was also worried I’d run out of yarn as the seller only had five left, so I decided to err on the side of a smaller size. The result is tight, but works - I’d much rather this way that too big. I needed have worried about the yarn: I've got a ball to spare (I got the yarn on sale - even with the buttons, a very cheap project). The other worry was that I didn't suit yoked sweaters, but I'm actually quite pleased with it. Despite all these concerns, I was completely convinced by the pattern. Not just for those of us who read The Owl Who Was Afraid of the Dark too much as a child, a properly lovely jumper. Full stats on ravelry. 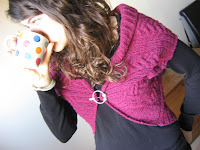 I also finished a purple tweed jumper (ravelry page here). 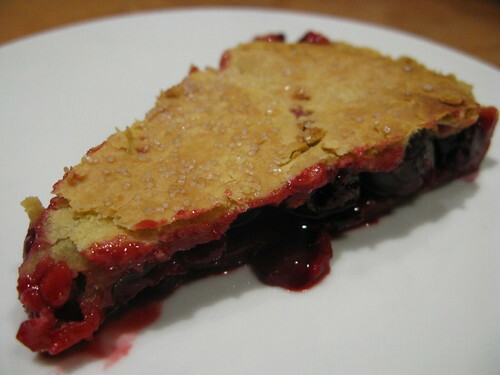 But it's really plain, so I'll finish with a shot of some hot cherry pie I made last night instead. Because that's what we need in this weather. Warm jumpers and hot puddings.